It turns out that philosophy is not only NOT boring, when appropriately applied, philosophy can help you understand yourself and the world around you. Philosophy isn’t about memorizing what Socrates or Plato said; philosophy is about curiosity and questions. That’s how Marisa Diaz-Waian sees it, and she’s on a mission to help bring philosophical thinking and questions to current issues humanity is facing, as well as the timeless issues of our lived experience in general: Who are we, how can we live the good life, and what does this even mean? From Philosophy Symposiums discussing the impact of AI on humanity, Bioethics, and The Environment, Ethics & Stewardship, to Philosophy Walks to ask questions and observe the world around us, to Philosophy Think & Drinks (my favorite), Marisa sees philosophy as a way to build collaboration, consultation, and community. That’s what it says on her website, but I like to add curiosity, because that’s where I see a huge need she can fill in our global community through these activities. It was her father’s way of asking questions and making her think about what she was seeing in the world around her that brought her to her interest and passion for philosophy, but she didn’t see it as a way of life right away. Her first philosophy class in college was her eye-opener, but the dream of bringing these ideas to the world didn’t come until much later. Throughout her bachelor’s degree, she combined philosophy with other areas of interest, not knowing that doing exactly that would set her up to see how philosophy could be applied to so many other subjects and fields. After high school I went to Saddleback Community College, then transferred to Humboldt State University. I was halfway through my BA degree when I returned home to be with my father, in light of an unexpected series of events – the separation between he & my mother and a life-altering health condition. My father had been diagnosed with Parkinson’s Disease, something we did not find out until later that summer. I transferred to California State University, San Marcos to finish out my degree and stay with him. After graduation from CSUSM, my dad’s Parkinson’s had leveled out some with the new regimen of medications and he was able to return to most of his normal activities (with caution). He was able to travel back and forth to Montana on his own, fly fish, and continue his post retirement research. I traveled with him frequently…and we still resided together (in California and Montana)…but I was on the road a lot with my job, doing concert touring and other oddball stuff. A couple of years passed like this and then he was in a horrible car accident en route to Montana. A triple roll-over, demolished airstream, and my father army-crawling out of the driver’s-side window in search of our cat, who had been ejected during the tumble and somehow managed (like my father) to escape with minimal injuries. A few broken ribs and bruising for him and a slight concussion for the cat. I have no idea how they survived. After the accident, my dad’s health quickly declined, and solo travel was no longer an option. Over the next couple of years, we moved to New Hampshire, he underwent brain surgery in Boston, heart surgery in Boston (unexpectedly), and then we returned to Oceanside, California. About 1 year after moving back to Oceanside and settling in, I applied to graduate school at San Diego State University. My father’s influence continued, and my enthusiasm for philosophy grew. 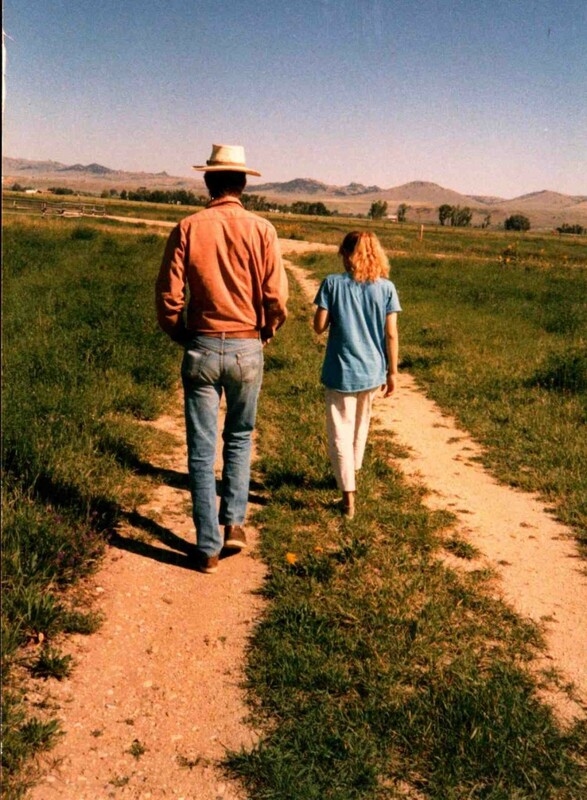 Our plan was for me to finish grad school, and then for us to relocate to Montana and live on the nature preserve. Every summer we went back to Montana to work on the cabin in preparation for our move. Unfortunately, our relocation never happened; my dad passed away on May 16th, 2010, about 2 semesters before I was due to finish grad school. I returned to Montana for the summer, a devastating one without my poppa, one of the hardest of my life. After the summers’ end, I drove back to Oceanside, CA to finish graduate school…the final semester of which was spent in Los Angeles caring for my grandmother during the last months of her life. Shortly after my grandmother passed, my thesis had been accepted, and I graduated…I moved back to Montana to stay for good. In thinking about this chain of events, I recall a precious memory shared with my father about 2 weeks before he died. I was inducted into a scholastic community, based on my performance in grad school. My father was in a wheelchair at that time (mostly due to lack of strength and balance). We were driving from Oceanside to the campus in San Diego and I remember seeing a car on the side of the road and an older gentleman pulling a gas can out of his trunk in route to the offramp. I began to pull over to help the man and I recall my father being very adamant that we would not be stopping — we had places to go. I was furious with him at the time, thinking that it was so selfish. Why shouldn’t we help the man? In retrospect, I wish I had not been so furious. My father had a deeper mission — me. And I also think he knew something that I didn’t; he was not going to make it to Montana. He knew he wouldn’tmake it to my graduation; for him, this award ceremony was my graduation, and he was going to be there to celebrate. And celebrate we did! At the ceremony, we were given medallions on long necklaces. During the opening portion of the event, we were asked to stand and put our hands over our chests, where the medallions were supposed to be, but my medallion was hanging so low that I had to put my hand over my stomach. We burst out laughing so hard that the spanakopita he had been munching on ended up all over me - and the back of the head of the man in front of us, who graciously understood, and had been chuckling with us about my comment. Moving in to care for him was an easy decision for her to make, and spending those 12 years with him as an adult, with his same extraordinary way of asking questions and making her think differently about the world around her lit exactly the fire she needed. Our conversation took us full circle, starting with describing Merlin and its mission, discussion about why she took that path, and the stories that drove her, and ending with how her development of this non-profit has contributed to our community. It was a couple of days after recording this podcast that she came to me with the realization that she knew her “why”, she was figuring out her “how”, and that the stories we uncovered during our conversation are the link between those. When we dig back into our memories for specific incidents and conversations that shaped us, we develop that link between our actions and thoughts, and can more intentionally align our dreams with our internal messages of strength, perseverance, and love. During our conversation, Marisa shared that her favorite, dog-eared, well-worn book is Plato’s Dialogues, specifically The Complete Works of Plato, edited by John M. Cooper. After our recording, I asked her for some suggestions for people who might be interested in getting started with philosophy and applications to current reflections and discussions. She suggested starting on the Merlin webpage, Resources, and the book Learning to Be a Sage by Hsi Chu. Marisa, is the Founder and Executive Director of Merlin CCC. Born in Santa Monica, CA, she spent the majority of her formative years along the coastlines of Southern & Northern California. As she grew older, Ennis, Bozeman & Helena, MT became regular stomping grounds. Her summers were frequently spent fly fishing, bird watching & “wandering into the great wide open” with her late father (and buddy), Lee. B. Waian. An active member of the Helena community, Marisa happily “hangs her hat” at Merlin Nature Preserve (located just outside of Helena) & serves as its trustee and steward. She stood outside her restaurant, unassuming, obviously an artist, with her cool hat and hip vest. I didn't know who she was; she introduced herself as Natalie, the owner of Chow in downtown Las Vegas.